When I ran my daily scans last night I couldn’t help but notice the number of energy stocks that were on the bullish list. Out of 14 total names on the scan, nine were energy-related issues with eight individual stocks and one ETF. Looking at both the daily charts and the weekly charts, there are two different outlooks for the sector. Rather than show all nine of the energy stocks that were on the bullish list last night, let’s use the Energy Select Sector SPDR ETF (NYSEArca: XLE) as a proxy for the sector. On the daily chart we see that the XLE is in the process of seeing a bullish crossover of its daily stochastic readings and that is likely why so many energy stocks appeared on my bullish scan last night. While the bullish crossover of the stochastic readings is one part of my scans, I always look deeper in to the stocks. 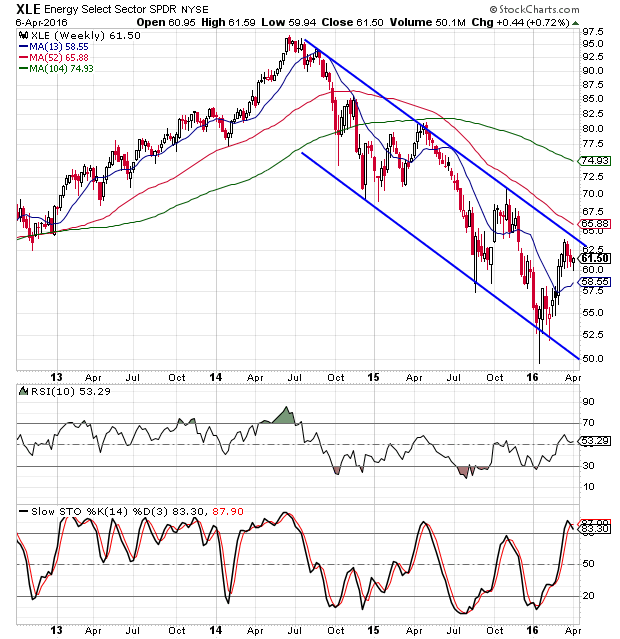 When I look at the XLE chart, I don’t like what I see at all. We see that the fund recently peaked at the $64 area and that was the neckline of the head and shoulders pattern I wrote about last fall. After that pattern developed, the fund fell all the way down below $50 and now it has rallied back, but where the $64 area served as support last October and November, it is now acting as resistance. While the daily stochastic readings may be making a bullish crossover, when we look at the weekly chart, we see just the opposite: a bearish crossover. In addition to the bearish crossover of the stochastic lines, we see a pretty well-formed trend channel that has dictated price levels for almost two years now, going back to the high in June 2014. Seeing the XLE up near the upper rail of this channel leads me to believe that the weekly chart and the bearish crossover is the outlook that is more likely to play out. The top five holdings in the XLE are Exxon Mobil (NYSE: XOM), Chevron (NYSE: CVX), Schlumberger (NYSE: SLB), Pioneer Natural Resources (NYSE: PXD) and EOG Resources (NYSE: EOG). These five holdings represent nearly half of the XLE’s assets. Looking at the chart of these five stocks, we see similar patterns with bullish crossovers on the daily stochastic readings and bearish crossovers on the weekly stochastic readings. I also looked at the sentiment toward the XLE and the top five holdings. The short interest ratio for the XLE is only 1.8 where for the five stocks, four of the five have a short interest ratio 3.14 or lower. The exception being SLB with a short interest ratio of 6.58. Because it is an ETF, the XLE doesn’t have analyst ratings, but analysts are pretty bullish on four of the five top holdings. Exxon Mobil is the exception here with eight “buys,” 10 “holds” and six “sells.” There is only one other sell rating among the other four stocks and they have a total of 103 “buys” spread among the other four stocks. Overall, the sentiment toward the XLE and the top five holdings is pretty bullish. Seeing bullish sentiment while the charts are suggesting a resumption in the downtrend leads me to believe that the XLE is heading lower. 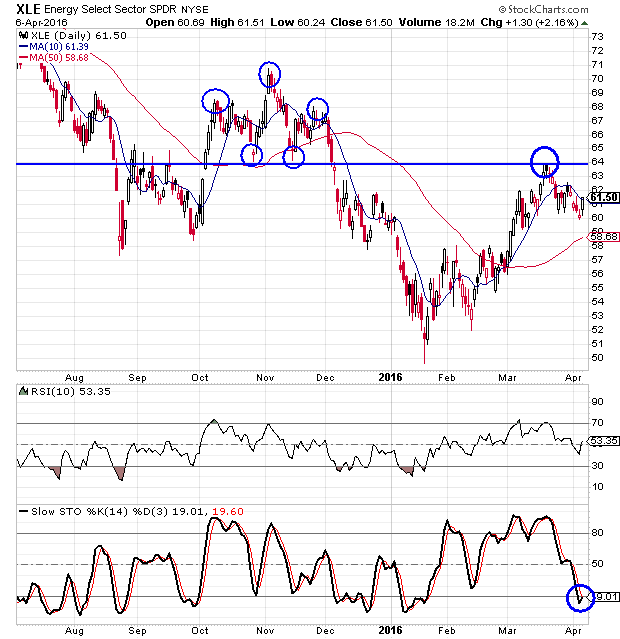 I would look to short the XLE at its present level and target a move down to the $50 level. Should the fund move above the $64 level, I would look to shut down the trade. Upon his death, John D. Rockefeller held a fortune worth $336 billion in today’s dollars. But the conventional account of how he actually made his billions is way off base. The truth is, much, if not most of Rockefeller’s vast fortune was due to one simple move. And by making this same move, ordinary people across America are getting rich, too. The best part: you can join them today. All it takes is a few minutes.